CNN report on eco friendly sustainable hemp house built in Asheville, NC. Benefits include carbon negative construction, breathability, and reduced cost of heating and cooling. Imagine you had a building material that was energy-efficient, non-toxic and resistant to mold, insects and fire. The material may even have a higher R-value, or thermal resistance, than concrete, a claim that is still being investigated. The only problem? The base of the Hempcrete creation is hemp, which comes from the cannabis sativa plant -- the same one that produces marijuana, which is a federally banned substance. Because of this, industrial hemp production is illegal in the United States. Seeing Hempcrete as a more efficient and sustainable building material has led to some dubbing it as a gateway product. The people behind the U.K.-based Tradical Hemcrete are using their hemp based product to create a carbon negative thermal walling material. 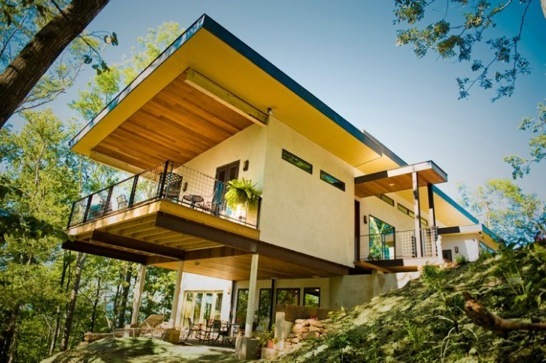 Hempcrete can be used for everything from roof installation to flooring to wall construction. The creators of the Carson, California-based HempTraders.com, distributors of “fine hemp products”, sell Hempboard. Hempoboard is a medium density fiberboard made from 100 percent hemp hurds and can be used to make environmental furniture, counter tops, walls and shelving. Considering the ban on the industrial hemp production in the United States, the eco-friendly and potentially cost efficient -- were it legal -- use of hemp for building will remain a bit complicated for now. Hemp Technologies have a section of their site dedicated to the perplexing history of America’s hemp laws, perhaps an indication that they understand their place in evolving the discourse on the issue that hemp isn’t just a “drug”, but an untapped, underused resource for good.